This is an amazing opportunity to join an organization that lives and breathes creativity, engagement and excellence. You will have the opportunity to take ownership of this role and develop a detailed knowledge of office coordination. Our client values service, integrity, teamwork and innovation. As the first point of contact, the successful candidate will be warm and outgoing; a people pleaser who is always striving to go above and beyond. They will also be polished and professional in their presentation and have excellent communication skills. A background in hospitality is an asset - willingness and flexibility a must! This is a temporary opportunity with the possibility for permanency for the right candidate. Looking to start work ASAP? Temporary opportunities, immediate interviews available! A number of our clients based in downtown Vancouver are looking to hire temporary and temp to perm employees right now! Positions available in Administration, Reception, Executive Support, Accounting and entry level office work! Ideally you will have some previous office experience, be proficient in Microsoft Office, and be available to start work right away! You must be reliable, easy to get hold of and flexible! Our client is looking for an intelligent, capable and mature Administrative Assistant to join their team. This is a fantastic opportunity to work with a close-knit team and gain invaluable experience that will allow you to grow and develop your already established administrative knowledge. If you are looking for an organization that really invests in its people and is making a difference in BC this may be the opportunity for you. Working from their Vancouver office with knowledge of greater BC, the ideal candidate will be warm individual who is eager and willing to assist in the day to day running of this small office. The ability to manage all interactions with necessary discretion and sensitivity is a desired trait of the ideal candidate. Reporting to the Executive Manager and Specified Projects Manager, the Administrative Assistant is responsible for providing front line communication and information to stakeholders and providing clerical and administrative support. You are professional, easy going, have an exceptional attention to detail, the ability to juggle a number of balls at once and can learn quickly without instruction. Please apply online @ https://expertrecruiters.secure.force.com/ExpertRecruiters with your resume and cover letter to the attention of Sarah-Ann McCabe, Recruitment Manager, quoting reference #2782-S, if you have already met a member of our team and are interested in this role please call or email us asap. Our client is a well-renowned Vancouver Organization and a leader in their field. They are looking for a polished and professional individual, who is extremely flexible and detail orientated with superior communicational skills and strong problem solving ability. The Temporary Administrative Assistant will report to the head of the department and is responsible for providing administrative and clerical support to the Executive Director and wider team. This is a temporary assignment with the possibility for longer term or permanency. Please apply online @ https://expertrecruiters.secure.force.com/ExpertRecruiters with your resume and cover letter to the attention of Sarah-Ann McCabe, Recruitment Manager, quoting reference #2790-Stemp, if you have already met a member of our team and are interested in this role please call or email us asap. Temporary Opportunities – Work that works with your schedule! Are you looking for temporary work while you job hunt or to allow you flexibility in your work schedule? With opportunities in the Greater Vancouver Area we are always looking for fantastic candidates to be Temporary Ambassadors for Expert Recruiters. Short and long term opportunities available, day of assignments and ongoing roles! Ideally you will have some previous and related office experience, and be proficient in Microsoft Office. You are reliable, easy to get a hold of, and flexible. Are you fluent in both English and Spanish and looking for temporary work? 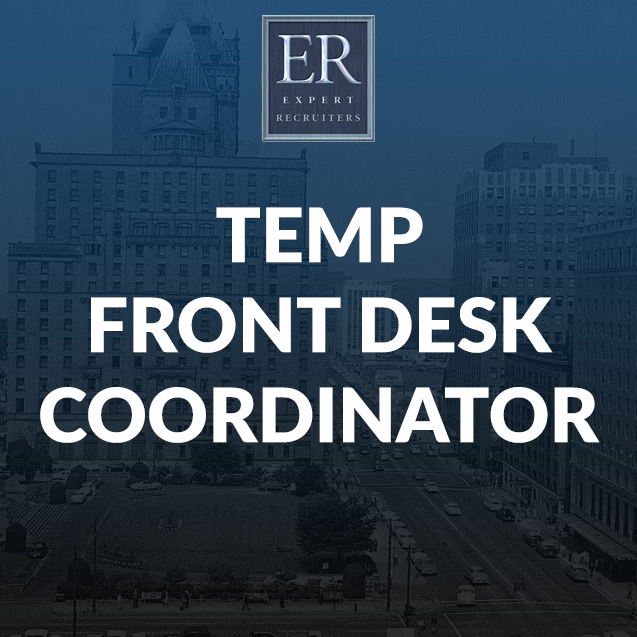 Our client is looking for a positive and engaging Receptionist to assist from September 5th – September 13th in their Downtown Offices. The ideal candidate has a minimum 2 years experience in an administrative or reception role and has managed a multiline switchboard. Are you looking to make the transition from the service industry or a new University Grad, this is an amazing opportunity to join a boutique firm in Downtown Vancouver where you will work with a close-knit team of professionals. Our client values service, integrity, teamwork and innovation. As the first point of contact, the successful candidate will be warm and outgoing; a people pleaser who is always striving to go above and beyond. They will also be polished and professional in their presentation and have excellent communication skills. A background in hospitality is an asset - willingness and flexibility a must! We will consider applicants who are on working visas. Please note this is a temporary position with the potential to go permanent for the right candidate. A number of our clients based in the Greater Vancouver Area are looking to hire temporary employees to support their daily operations. Short and long term opportunities available! Our client is looking for an intelligent, capable and mature Administrative Assistant to join their team. Working from their Vancouver office with knowledge of greater BC, the ideal candidate will be warm individual who is eager and willing to assist in the day to day running of this small office. An understanding of the healthcare industry and terminology, along with possessing the ability to managing all interactions with necessary discretion and sensitivity is a desired trait of the ideal candidate.